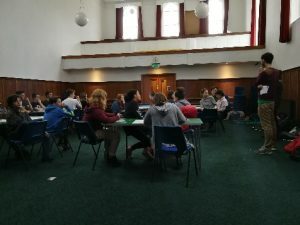 On the 15-17th March 2019, 21 young people and 5 volunteers met for London Link Group Brighton 2019! This event coincided with the international climate strike that was organised on the Friday 15th. We were all impressed to hear stories of this march and glad that members of London Link Group could help bring young Quakers together for it. 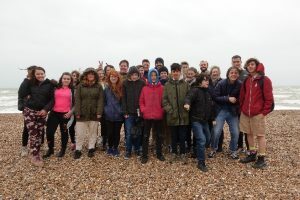 We headed off to catch a train, a few snacks-to-boost-our-energy-levels later we arrived in Brighton Meeting House to the welcome of local Brighton Young Quakers, the meeting house and dinner. Our theme for the weekend was ‘Welcome’, so this not being lost on us… we welcomed everyone to the event! it was great to have a number of new faces with us. We didn’t have long left of the day so we had an Epilogue (a short reflective evening Quaker meeting) and then a bit of free time and bed. Saturday Breakfast filled us with veggie sausages, scrambled tofu, potato waffles, toast and beans! 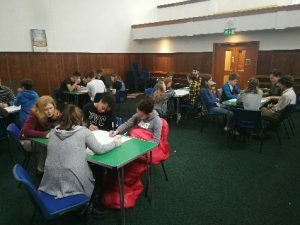 We then ran a marathon workshop, based on a resource from Becoming Friends Together . We considered ‘what makes a good welcome’. From exchanging smiles, reaching out to people, asking how they are, to making sure there is always a space for someone to join a group (e.g. sitting in croissants not doughnuts! O ⇒ C ). 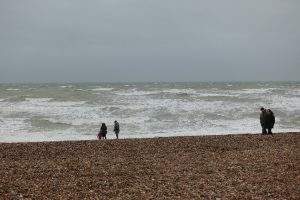 After this we ventured out into a very windy Brighton and in groups went to explore. 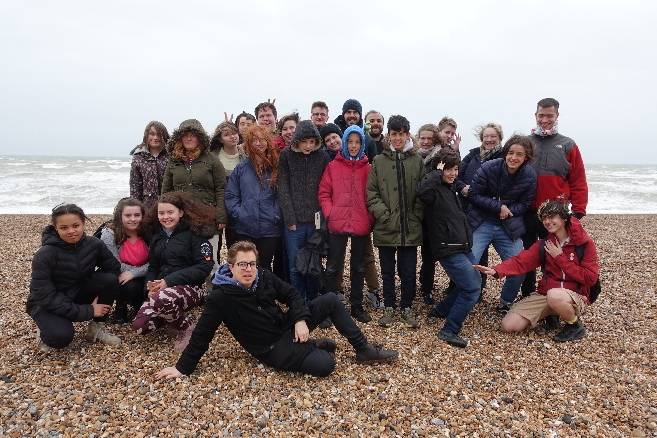 The young people having exhausted Brighton of it’s cultural, arts, architectural and historical sights (or was it Tescos? 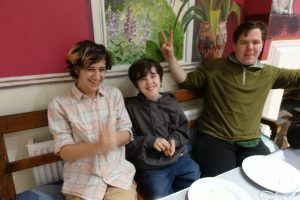 I forget..) and the volunteers having drunk all the teas and eaten all the cakes, gathered back at the meeting house for lunch, that being a wrap we had a little more free time until gathering again to hear from two young people who came to the UK as refugees. Supported by the The Humming bird project they spoke movingly about their journey to the UK from Syria, the incredible danger of their journeys, such as hiding in lorries headed for the UK and the treatment they had in Calais by police. We were shocked that even in a welcoming (to us) place like Brighton they struggle against racist behaviour and islamaphobia on a daily basis, keeping themselves only just afloat with the money they are given to survive on compounded by the difficulty to get any work because of different qualifications or outright discrimination. At least an hour past where you could have heard a pin drop. Their stories were that of immense hardship and difficulties, but incredibly they still had enough hope and determination to try to live their hopes and dreams. They explained that part of what keeps them going was being able to share their stories with people like us, countering the increasingly hostile environment and being a part of the humming bird project to try and make sure that future refugees don’t suffer as they did. Truly inspirational. After a break to digest this session the young people organised some games, quieter games like bannagrams, cards and mafia broke way to several rounds of everyone’s favourite game: sardines. Before dinner we practised a song that we were invited to sing in ‘all age worship’ (like regular Quaker meeting but a bit more programmed to help involve all ages) on Sunday. You can hear our second practice of the song in the video below . A curry dinner gave us the energy for a fantastic ‘open-mic’ session. We had 10 or so brave and excellent performers, including our very own Eli Carjaval performing his own song “about finding those places and people that help you express your whole self, without fear.” A clip of him singing to us also below . Thank you to everyone who contributed and the audience who listened and encouraged so well. A very gathered and still epilogue. Some hot chocolate then bed. Sunday sun shone in to the Meeting House. 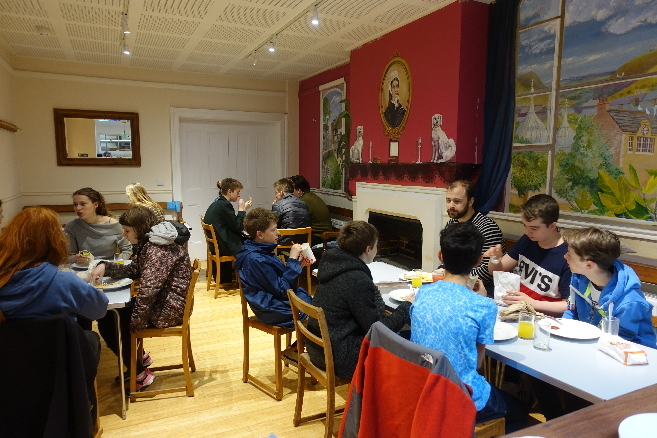 A breakfast of cereal and toast took us to joining all age worship which was coordinated to also be on the theme of ‘welcome’. After this some participants and members of the meeting joined a workshop run by Ben Pink Dandelion about making our meetings accessible and focusing on things that are important. Lunch time all too quickly lead to saying goodbyes as we left to journey home. As one participant said “One of the best trips ever, Will enjoy channelling my new found inner Quaker whenever in need, thank you so much”. Thank you to everyone who was involved and made it such a great weekend. You’re more than welcome here.